threats, alibis, songs, jokes—a masterpiece. The Typists Play Monopoly is a clever book, one that pays close mind to the everyday in a fresh way. 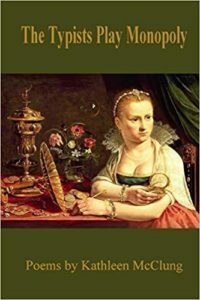 Kathleen McClung brilliantly uses traditional forms of poetry to share existences how they truly are or as the past is faithfully remembered, the hang-ups and thrills playing in realistic speeds. What grabbed me about her choice of poetic delivery is my own notion of restraints held in form, how topics can sometimes be bland and repetitive when written in sonnets or sestinas. McClung proved my thinking wrong. I’m a judgmental reader at times: I prefer free verse and am often bored by most attempts at forms, despite the difficult corner traditional writing tends to dare writers to break from. Truthfully, it took me a bit to notice McClung’s poems were using rhyme and meter so frequently; her lines are delivered with a comfortable flow in the fluid hold of form, but don’t bother with expected rhymes that are painfully obvious in typical goes at sonnets. The close detail of tellings, especially in the family poems, are almost like miniature films—the descriptive bracings essentially play home movies as the conversational lines lead the readers into warm memories. McClung uses wit to counter interactions that might seem too plain to poem otherwise and balances the more harsh and devastating bits with love and nostalgia. What grabbed me most when reading The Typists Play Monopoly is the wide-angled scope of people-watching and the empathetic ponder applied to each study, especially found in the Renter Sonnets. Her descriptive skill is hard to beat, and while I loved her longer lines with great detail, I was likely most impressed with the succinct blinks of reaction in which she often ends her poems. “In Renter Sonnet (6),” for example, McClung lays multiple descriptions to give the reader a clear look at a man she’s attempting to show. So lost in placing a face on this man through her poem, I was taken aback by the way it ends with “I smell his grief.” Reminding the reader that there’s a lot more going on in a situation than what is obvious, McClung makes us more perceptive to individuals’ dealings. She’s teaching us to pay attention, I suppose—to see situations’ effect on people more than relying on our uninformed assumptions of behavior. McClung has a go with persona poetry as well and proves not only that she can slip in and out of the watcher’s eye but can submit her understanding so closely to those we so often find ourselves watching. In “Bridgework: A Span of Sonnets,” we’re put in the place of various citizens, vital contributors to a community experiencing something as mundane but life-altering as bridgework. These people are decidedly just like the rest of us despite our often off-base perceptions of them. Via this careful character study, we’re offered a way to experience being a patrolman bored with monotonous stops, a laid-off toll-taker replaced by technology, a creative painter who settles for a day job, a crisis counselor breaking down, or a traffic reporter rambling out his affections for his work. A collection anyone can find interest in—whether it’s for the stunning execution of forms such as centos, sestinas, sonnets, and villanelles, or the way McClung blends topics with humbling tenderness and informed exclamation—The Typists Play Monopoly proves traditional work can be at least as accessible as free verse and that ordinary lives are anything but easily understood. Kathleen McClung, a native of northern California, is the author of the 2013 chapbook Almost the Rowboat. 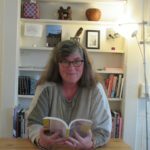 Her work appears widely in journals and anthologies including Atlanta Review, Ekphrasis, Mezzo Cammin, The MacGuffin, Peacock Journal, Unsplendid, Raising Lilly Ledbetter: Women Poets Occupy the Work Space, and A Bird Black as the Sun: California Poets on Crows and Ravens. She holds masters degrees in Education and English from Stanford University and California State University Fresno, and she teaches at Skyline College and The Writing Salon. She directs Women on Writing: WOW! Voices Now on the Skyline campus, celebrating creativity in writers of all ages.